FAMILY LAUGHS LINEN WALL ART by Accent Plus home decor, jewelry, decor, decorations, electronics, fountains, floor mats, art glass, vases, garden essentials, fireplace screens. 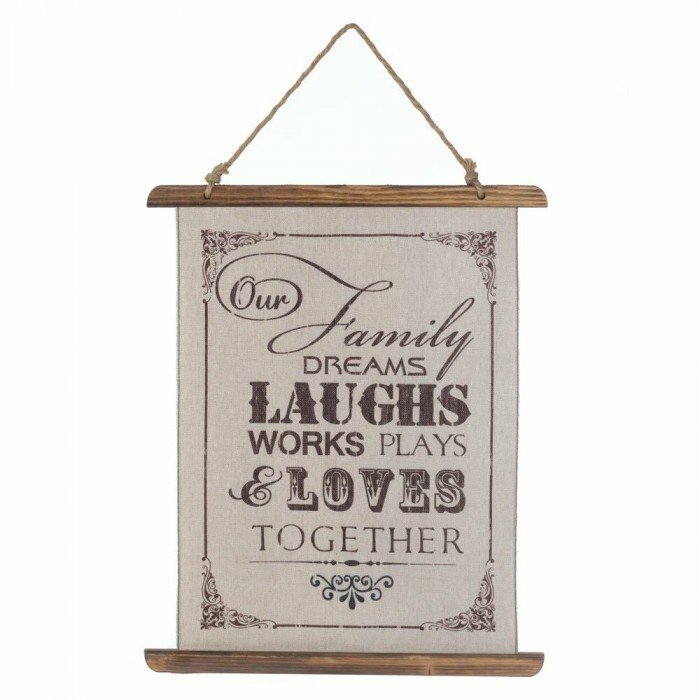 Together is the greatest place to be, and this wall scroll reminds you every day of the journey your family is on. The linen scroll is set between two wooden dowels and hangs from a rope, and the graphic reads, "Our Family Dreams, Laughs, Works, Plays, & Loves Together". Material(s): LINEN ROPE LINEN WOOD - FIR. Weight	0.6 pounds. Dimensions	17.8" x 0.75" x 21.8".